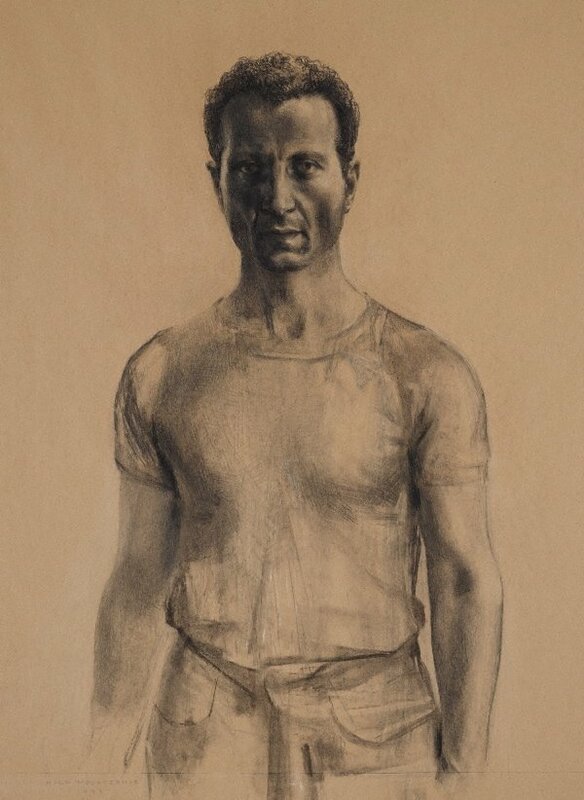 This drawing is a self-portrait made over a period of a year after the death of the artist’s mother, a time of intense emotional introspection for him. It began as a study for a painting, to examine scale, format and structure. The work extended beyond this very quickly and from an initial intention to spend several hours, the drawing involved me for several months … 'The drawing was made with and without reference to the mirror, in both artificial and natural light. The work engages the presence of mortality and grief (as well as) continuity …' (Nick Mourtzakis, 2000). A watercolour – 'Eleni Mourtzakis, the artist’s mother' 1984 – is in the Gallery’s collection (see Hendrik Kolenberg, Australian watercolours 1880s to 1990s: from the Gallery’s collection, AGNSW, Sydney, 1995, p 107). This work won the Dobell Prize for Drawing in 2000 and was acquired by the Gallery in 2000. Signed and dated l.l., pencil "NICK MOURTZAKIS/ 1999".